With the market getting more competitive than ever, you have to think of newer ways of advertising your products or services; otherwise, there is a high risk of getting left behind. Gone are the days when you could issue a print or electronic advertisement and expect consumers to notice your products and initiate sales. Now is the age of in-your-face marketing; you have to be visible everywhere to make a mark. This is because there are countless others like you, offering the same product or service. In such a scenario, how can you distinguish yourself from the rest? Simple! By opting for new and innovative ways of advertising, such as customized umbrellas. A custom umbrella is nothing but one that is designed with a specific purpose in mind, which is mostly to promote a product or service. These can be seen in trade shows, restaurants, fairs and festivals. They serve the purpose of providing shade to those sitting below while promoting your company at the same time. 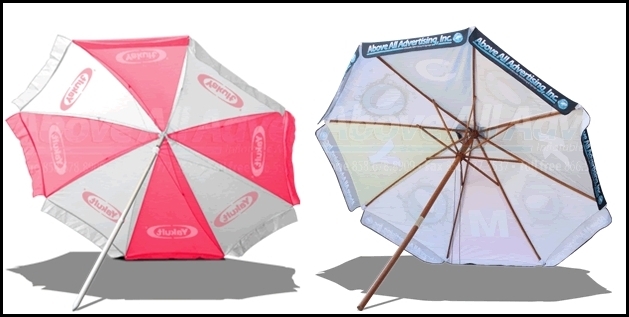 Business owners usually print their advertising messages or company logo on such umbrellas and use them in the marketplace for promoting their brand name. Light materials are used to construct these umbrellas, which are also weather-resistant since the main purpose of an umbrella is to protect those sitting below it from rain, snow, heat and other bad weather conditions. These are available in various vibrant colors so that you can choose one that goes perfectly with your brand. In fact, it is a good idea to create these shades in the color your business or, more precisely, its logo is known by. This can help your target customers easily identify your brand, thereby serving your actual purpose. The best thing about a custom umbrella is that you can design it the way you want. You can either print separately on each panel or opt for a print that covers the whole top fluidly. They are also known by the name of golf umbrellas owing to their dominant use in golf fields. They are capable of holding 2 to 3 people under them. They have wooden handles and steel rims, and an arc of 50 to 68 inches. They are a favorite as promotional products because any sports event attracts a huge number of spectators, which opens the prospect of attracting more eyes. These are normal ones which are small in diameter, foldable and lightweight. A lot of variants are available of this type, such as wooden handled, foldable, non-folding, multi-color etc. Since they feature most assured visibility and high-level usage, they are most effective in helping brands market their products and services. These are not a unique variant, but both the above-mentioned types can be telescopic. It is very easy to disassemble these shades. You can insert the handle and frame into one another and remove and fold the canopy in order to keep them in hand bags. Thus, order a custom umbrella with your company's logo imprinted on it and popularize your business.